My father died when I was 8. I have a black and white picture of him on the streets of Woodbury, VT and this reminds me of that very area which remains somewhat unchanged. I love the American Flags waving and the colorful leaves and awnings on the shops. It is downtown America at it’s best. Thank you Peter. Thanks Mary, good memories are priceless, perhaps our most valuable of personal “possessions”. Interesting how art can evoke them so well. Peter! Why not tell me you were in town? I live here ! Looks great! I promise to look you up next trip Steve, thanks! I wish I was strolling down that street. I love all the fall colors. Thanks again for a momentary escape from South Jersey to Vermont! You know it’s my pleasure Randy, thanks! 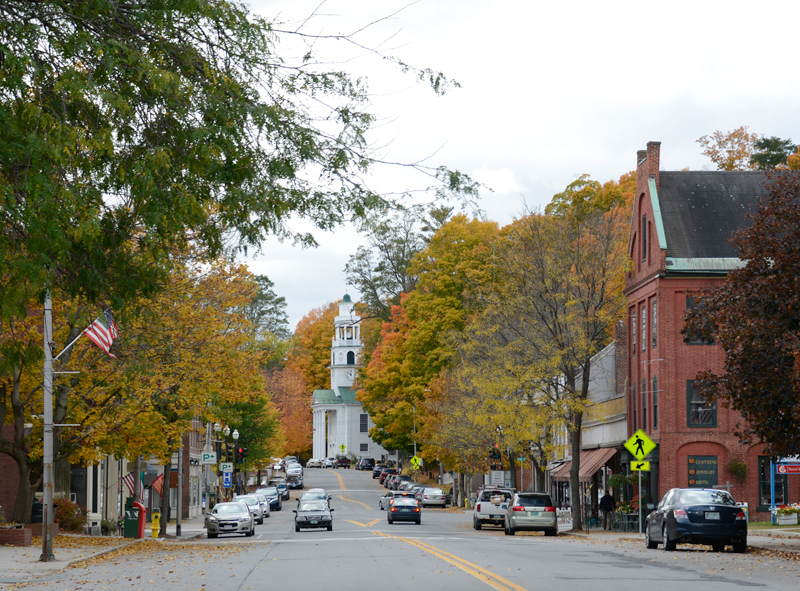 Quintessential Vermont in the fall with the leaves ablaze with color! You really captured it all! To me this painting is all about color, especially celebrating the rich and strategic use of varied reds and golds, (and the wonderful shades of violet in the tree on the right.) From the brick building, to the red stripes on the flag, to the small central automobile, the eye is lead onward to the focal point of the church, richly framed by the brilliance of autumn’s glory! I can’t get away with much with you Brian. That pretty much sums up my approach to this composition. Thanks! I got to see you painting this this past weekend. Indeed we do, thank you Theresa! Wonderful painting. We were in the Chester/Springfield area all last week and the trees were really changing and beautiful. Took side trips north and east and there was a lot of color. Hopefully there won’t be a lot of wind or rain until you can get a few more paintings with the Vermont foliage. Agreed Catherine, I hope to get several more days of “image collecting” before they are gone. Thanks! I love this one!! I grew up in Windsor even graduated high school there and spent so many days walking that very street!! This is a special one to me for sure!! Thank you Cheryl, glad you like it! I was in that very church Saturday, 10/8, for my cousins funeral. You have certainly captured the warmth I always feel in that town. Bravo! I met you for the first time yesterday, Sunday 10/9 at the Art in the Park in Rutland and I will definitely be in touch with you my next trip north! Sorry for your loss Judy. Great to meet you and I’ll look forward to seeing you again. Will you be having prints available for this Windsor painting. Yes Lorraine, I do have prints available. Just hit the button above to the right of the image that says “Order Print”. that will take you to my shopping cart and the print where you have several size and framing options. Thanks! Love the little cars! Such a beautiful scene of a delightful town! I do like painting those little cars! Great to see you at art in park Muriel, thank you! 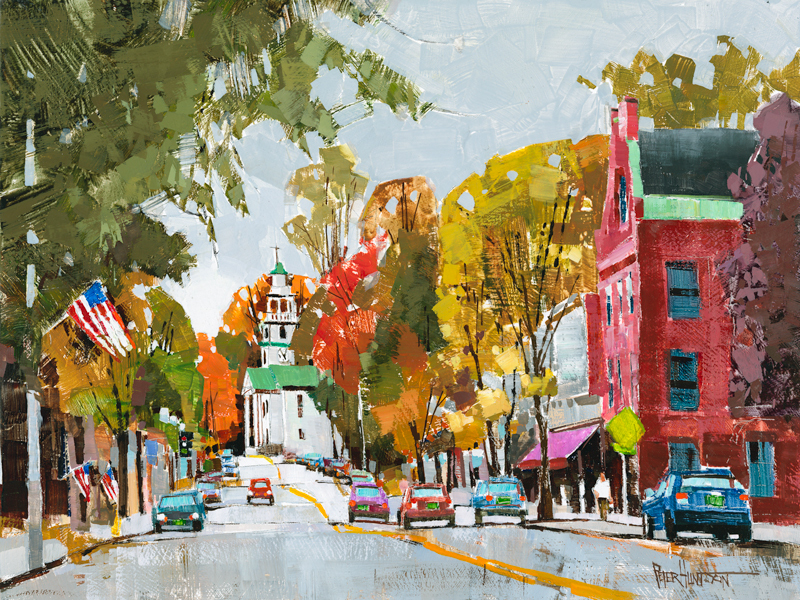 Looooove this painting……Wish I could be in Vermont this very minute. Thank you June, we wish you were here too! Lived across the river but attend high school in windsor, view from my house was of Mt. Ascutney and the Cornish/Plainfield area. Get back to Windsor several times a year physically and many other times down memory lane have lots of special memories of this street and the church and steeple are literally like a beacon to the community in my mind. Walked this route back in June for the reunion parade. Beautifully captured in this painting!!! Thanks for another walk…. Not sure what church that is Cynthia, but She’s a beauty! MP was a great artist, what an honor to meet him in person. Thanks! Hah! I was born and raised in Windsor, and this work of art invites me right back to my history. . . the old theatre, shoe store, jewelry store and Buster’s drugstore which are all long gone. 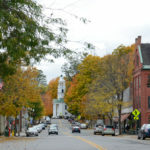 My years working at the Windsor Diner, being loved in my grandmother’s apartment, the nice folks at the old Vermont National bank, … all community, all cherished. Thank you for the pleasure of the memories.